It’s the Doctor Who Christmas Special and that means there’s going to be a heart breaking goodbye. This time, however, there was a long awaited regeneration to go along with it. 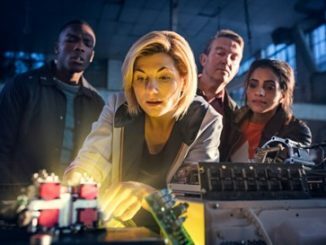 And as Peter Capaldi said goodbye to the TARDIS, Jodie Whitaker brilliantly arrived, and Doctor Who will never be the same. Or will it? 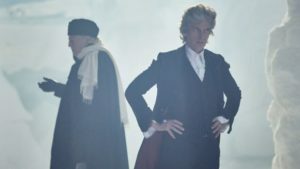 Twice Upon a Time has a unique premise to it. The Doctor has been mortally wounded and his regeneration has begun. But Peter Capaldi’s twelfth Doctor is tired of changing his face and refuses. So, the TARDIS takes him to the only person who can give him a different perspective … himself, in the form of the First Doctor, played David Bradley. The First is having his own crisis with regeneration, and refuses to let it happen. Wandering around the arctic cold, he comes across Capaldi’s Twelve, and they both realize they are there to not only have one last adventure together, but to come to terms with the inevitable event. Then comes the twist … in the form of time stopping. And Twelve realizes that if One decides not to regenerate, all of time will break, as everything the Doctor has done for centuries will be undone. So while struggling with it himself. Twelve has to convince One that he must regenerate, and that puts him in a strange predicament. 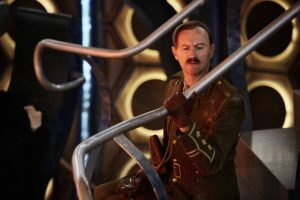 I really liked this episode, especially the twist with the World War I Army Captain (Mark Gatiss) who has been pulled out of time just before he dies, by glass beings from the future, known as “The Testimony.” The Testimony is an artificial intelligence that harvests the memories of those who are about to die by taking them out of time, copying their memories, and then putting them back. That way, they live forever. The Doctor learns this by enlisting the aid of the largest known database in the universe, ,the collective consciousness of the Dalek “Rusty,” acting in a hive mind with the rest of his kind. 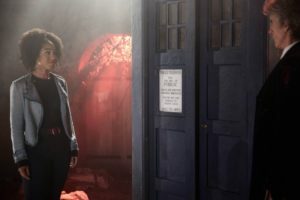 In the end, with some help from the memories of Bill Potts, Nardol, and even Clara Oswald, the Doctor realizes it’s time to let another continue on, for the more he saves the Universe, the more the Universe needs saving. Things I liked about the episode .. There’s some great comedic lines, and something we’ve never seen before … a villain who really isn’t a villain, after all. And when the Doctor realizes that, he doesn’t really know what to do. That was brilliant. Then there was learning that the Captain is the grandfather of the Doctor’s old friend, Brigadier Leftbridge-Stewart, who was killed in action during the Great War. 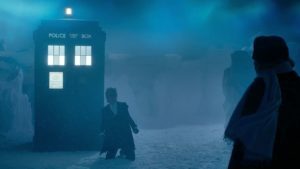 My favorite moment, though, is when the Doctor brings the Captain back in time to face his demise, just moments before the great Christmas Truce of 1914. 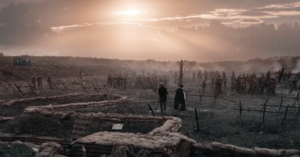 Kudos to Moffat for reminding us of this real historic event, where where German and British troops put down their guns for a day, sang Christmas Carols, and knew a gentle peace. It was a marvelous, and the Captain is granted a reprieve as a result. I also had some misgivings, however, about this episode. First, there was Moffat’s choice of making the First Doctor uncharacteristically sexist. 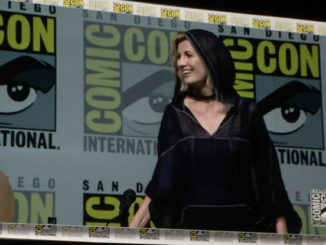 I understand why, it not only points to the era that the first doctor was from, in the 60s, but I also think that Moffat did it to hold a mirror up to the sexist reactions that some critics had when Jodie Whitaker was announced as the first female Doctor. 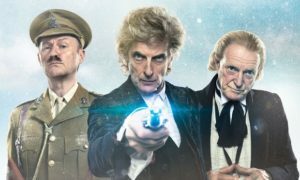 Character wise, though it was cringeworthy, and on more than one occasion, Twelve has to remind One that he “can’t say things like that.” I also think that if you take the First Doctor out of the episode, you could still have the story proceed. So his impact on the story was more of a McGuffin. Capaldi’s goodbye speech reciting some classic words about why the Doctor chose his name. “To be neither cruel, nor cowardly…” But the speech sounded too much like just that, a speech. It’s not really his goodbye, so much as outgoing show runner Steven Moffat’s, as if he’s trying to outdo 11th Doctor Matt Smith’s epic goodbye with some wise words to the 13th Doctor who is just moments away. Then bringing Clara back for a cameo. Moffat just couldn’t resist inserting his favorite companion into the story one last time. I get why he did it, he wanted to tie up a lose end, showing that the Doctor remembers Clara now, when he had forgotten her as she died. Honestly, though, bringing Bill served the story more, since Doctor isn’t sure if she’s real or just a copy meant to deceive him. That brought some good conflict to the party. Clara’s cameo just seemed another echo of what Moffat had done when Matt Smith’s Time Lord saw a vision of Amy Pond just to part ways. Worked great then, a collective eye roll now. Finally, there was the regeneration itself. While the BBC hype machine kept telling us that this regeneration would be different, it really wasn’t. The Doctor knows he’s going to start changing, so he sets the TARDIS to begin to fly. Then he utters his goodbye and changes. 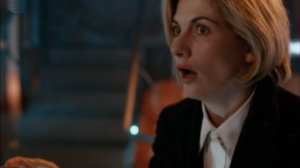 And we see Jodie Whitaker for the first time, who utters what may be her catch phrase … “that’s brilliant,” before she pushes a button and the TARDIS begins to crash. But I did like seeing Whitaker’s arrival, and how director Rachel Tallaly shot around her so we didn’t get a full glimpse of her right away. It was with close ups, and with set pieces obscuring her entire image, then a first person shot from her point of view. Then she crashes the TARDIS and gets sucked out, plummeting to the planet below .. and that’s where we’re left. Until next Spring, 2018. 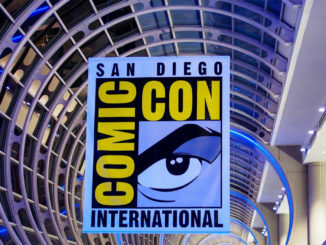 And the world of Doctor Who will never be the same, but all the better for it.